This entry was posted on March 7, 2015 at 7:44 am and is filed under poetry, Uncategorized. You can subscribe via RSS 2.0 feed to this post's comments. Another truly remarkable poem from your pen, which effortlessly weaves the tale of life and death, our living connection to the good things of the earth. I was captivated by the tone and voice and the personal account. Thanks so much, Kerry. I hope you know how absolutely inspiring and profound I found your recent poem on this prompt–the scent of rain. It was such a sad and moving poem, and that I felt all my efforts somewhat trivialized–which kind of led to this one. That Scent of Rain–I may not have it right–is just terrific. k.
Thank you, karin. I guess inspiration goes around. Poetry is always at its best when poets work in concert together. Marion, do you ever record yourself reading your poetry? This one should be read aloud. The O’s of “clots,” and “loss” and “over-lording” and the internal rhyme, the assonance. And that’s just in the first stanza. And your progression from blood, birth and miscarriages to the garlic cloves, together and apart. You reconcile “blood and/ baby teeth, burn and savor…” in a surprising, organic, satisfying way. I really admire this, so very much. Hey Mary, (I think you mean Karin–but that is okay). I haven’t done any recordings for a long time, in part because I travel a bunch and rarely can be in a room where no one can hear me! But I appreciate the thought and will consider it. Thanks again. k.
Yes, I realized the mistake. No worries. And I knew who you were. Got interrupted going over there by phone call. Your dog is so cute! k.
Thanks. He’s sitting in the chair w/ me and helping me write just now. 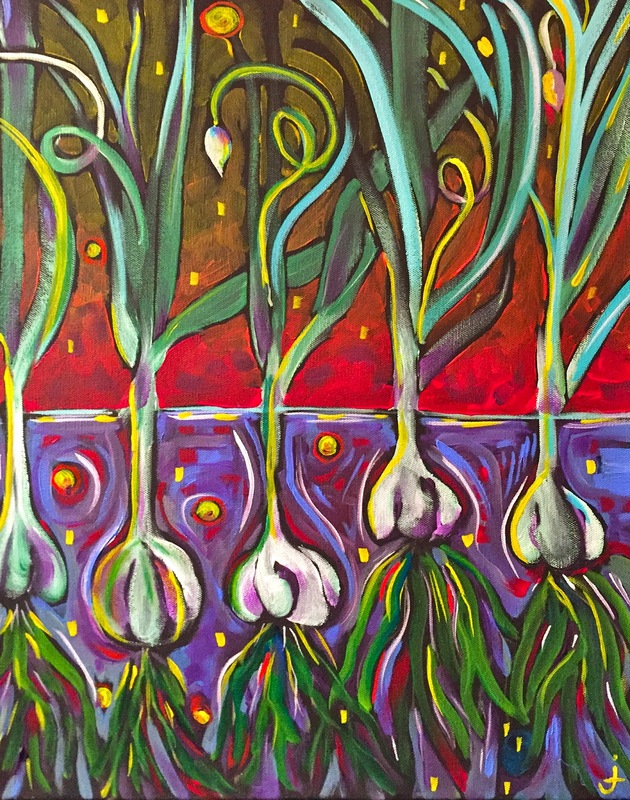 Who would have thought there could be such a moving poem with garlic as its starting point? Wonderful. Ha. Well, I am a vegetarian so it was a bit weird for me. I ate a clove an hour for several days straight–then many cloves/garlic pills a day, though the cloves are much more potent–it worked very well as the parasites had made me terribly anemic. Thanks, Bjorn. k.
Thanks– Garlic, I think, has a lot of potential as a subject! (Ha.) But, really, it is so very worldwide– and then there’s the whole anti-vampire aspect! k.
Never say “sorry” for penning a beauty like this one. The way your poem unfolds renders it poignant and lyrical. Thanks. This is remarkable, Karin, covering so much of what concerns me as a woman- blood, birth, grief and the everydayness of cooking. I love that image of the garlic doing battle with the worms and winning. We pay attention to our experiences but what do we know in the end? Maybe nothing but wise as well. And we’re so blessed- a live child, health. Yes, remarkable. Thanks so much, Mary. k.
Ah…’the cloves cleave’ – your use of language in this poem shows your wonderful wordsmithery – I enjoyed this very much.